Huawei’s 5G NR products have passed TÜV SÜD's (the European Union's certification authority) strict verification requirements after several rounds of rigorous testing and evaluation. 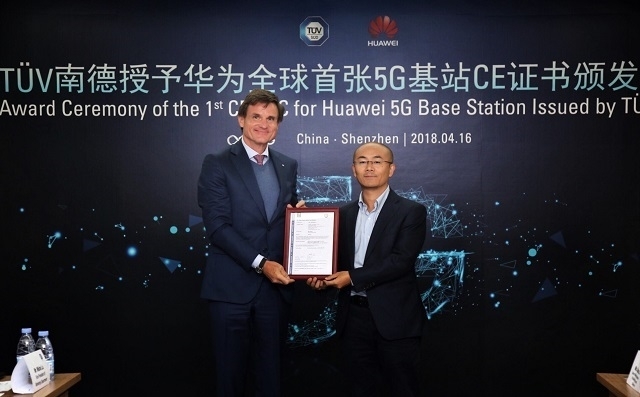 Huawei is now the first company to achieve a CE type-examination certificate (TEC) for its 5G products. Obtaining this EU mandatory certificate indicates that Huawei's 5G products have won official approval for commercial use. It also represents a significant step towards realizing large-scale commercial 5G deployment. Huawei's CE-TEC verified 5G C-band Massive MIMO AAU is developed based on 3GPP TS 38.104. Designed to suit large traffic eMBB scenarios, the AAU is able to offer continuous xGbps outdoor experience and ms-level latency. Huawei strictly followed related regulations during each step of 5G product development from component selection to product design. After multiple rounds of meticulous assessment and inspection, Huawei's 5G products passed TÜV SÜD's verification at the first attempt, meeting all stringent CE requirements. CE marking is compulsory for products imported to and sold within the European Economic Area. This marking is regarded as the stamp of approval required for entering the European market. Products with the CE marking conform to Europe's directive requirements on RED, LVD, EMC, RoHS, and WEEE. Being awarded the CE certificate shows that Huawei’s 5G products fully comply with the strict admission requirements of the European Union and are now qualified to be sold and applied in the European market. TÜV SÜD, headquartered in Munich, undertook the CE marking verification of Huawei's 5G products. This organization is dedicated to professional testing, inspection, and verification, while boasting a proud history of over 150 years of extensive experience in verifying communications products. As one of the most influential third-party certification authorities in the world, TÜV SÜD also boasts leading industry experts and a first-class inspection platform. Huawei Wireless and MPE Global’s Compliance and Testing Center have forged a lasting long-term partnership with TÜV SÜD. The two parties are committed to exploring the verification technologies of communications products. 5G technologies and product forms are more complex than those of LTE, posing enhanced verification challenges. The combined efforts of both parties have yielded substantial breakthroughs in key verification technologies. Huawei’s 5G products now strictly adhere to CE standards, meeting the EU's requirements in terms of RF, EMC, Safety and EMF, and RoHS.